With the advent of the Trump administration, would not, first, Russo-US relations improve, allowing Japan to make progress in negotiations on the Northern Territories with Russia? Until early this year, within the Japanese government, there were expectations of this sort. However, from just before the Trump administration took office on January 20, doubts began floating as a scandal unfolded in US political circles about whether there were improper relations among those close to the President Donald Trump and the Russian authorities. When April arrived, the United States, by conducting a military strike in Syria, worsened its relationship with Russia. For these reasons, Trump, who had sought to engage in improving relations with Moscow, now found that his hands were tied. Also, as the Democratic Party deepened to the White House and the ruling Republican Party, with few personnel being selected for State Department posts, there was no way to get started revising policy toward Russia. Persons connected to the Japanese government looked askance at US-Russian relations, which were left hanging, anxious that Japan’s relations with Russia would also not move forward. “Would Trump remove the sanctions on Russia?” Officials in the “Russia school” of the Japanese Foreign Ministry, who are in charge of Russian relations, were airing such expectations in mid-January just before the start of the new US administration. Through last year’s presidential election, Trump repeatedly expressed his goodwill toward President Vladimir Putin and pleaded the necessity of improving relations with Russia. For that reason, one wondered if, as soon as the new administration took office, it would end the economic sanctions that the Obama administration had imposed on Russia over the 2014 annexation of Crimea and downing of a Malaysian airliner. Many calculated that the EU, too, which had imposed sanctions under US pressure, would begin considering sanctions removal. Accordingly, the Russian school officials of the Japanese foreign ministry expected that Japan may similarly adjust its attitude and proceed to remove the sanctions it had imposed on Russia. However, doubts about such prospects became increasingly pronounced since the beginning of the Trump administration, which have not yet been extinguished. Rumors floated that when Trump had earlier visited Moscow, the Russian side may have caught him in a scandal involving a woman. Just before Michael Flynn became Trump’s national security advisor, it was revealed that he had discussed the possibility of sanctions relief with the Russian ambassador to the United States Sergei Kislyak, for which he was driven to resign from his position. Paul Manafort, the chair of Trump’s election committee until last summer, was suspected for his dealings with Russians, and news even circulated implicating Jared Kushner, Trump’s son-in-law and top-level advisor, for meeting a leader of a Russian bank on the subject of US economic sanctions. In the US Congress, where sentiments toward Russia had been harsh all along, suspicious discoveries were noted one after another, strengthening calls for the intelligence committees of both chambers to conduct investigations. With ceaseless revelations of scandals implicating Russia, it was leaked that Trump had realized he could not improve relations with Russia. “Probably US-Russian relations will not go well,” a Russian school official of the foreign ministry—who had previously said that in case of improved Russo-US relations, Japan would make progress in expanding its relationship with Russia—now speaks in a half-resigned manner. If the Russo-US relationship does not improve, why will it influence the territorial negotiations between Japan and Russia? It is because security—for which Japan is intricately connected to the United States—is considered the most difficult sticking point in case talks should advance between Japan and Russia for signing a peace treaty and transferring the Northern Territories. Even last November, when Yachi Shotaro of Japan’s National Security Council (NSC) met Nikolai Patrushev, secretary of the Russian Federation NSC, the focus was on the Northern Territories and security. What Russia especially warned against was a situation in which US troops in Japan would be stationed on Habomai or Shikotan, should they be transferred in accord with the 1956 Japan-Soviet Union Joint Declaration. In the Japan-US Security Treaty, US forces in Japan have the responsibility to defend the territory under the administrative authority of Japan. Should the two islands be transferred to Japan, the United States may want to station its forces there. In contrast, the Russian side would not see the value of transferring the islands if it incurred the danger of the US military advancing right under Russia’s nose. In December, Putin himself spoke about the issue of linking the Northern Territories and security when he visited Japan. The Japanese have now grown aware that Putin has some sort of security preconditions in mind for a deal. There is one more reason why Japanese officials in charge of relations with Russia are paying attention to how Russo-US relations are unfolding. This is due to their bitter experience during the Obama administration. Japanese Prime Minister Abe Shinzo took office in December 2012, and four months later in April 2013, he made the first official visit to Russia in ten years by a Japanese prime minister and reached a basic agreement with Putin to advance negotiations on the Northern Territories. This was Abe’s attempt at using international summits to meet and forge relations of trust. However, when the Ukraine crisis began in February 2014 and Europe and the United States drove Russia out of the G8, Japan alone could not advance relations with Russia. Even so, Abe did not lose hope of improving relations with Russia, concluding a peace treaty with it, and bringing to a close the negotiations on the Northern Territories. But the Obama administration continued to exert pressure on the Abe administration, through strong language and back channels, even speaking at news conferences concerning Japan’s designs to improve relations with Russia. The Russian school of the foreign ministry was not pleased with the Obama administration not simply because Japan was criticized for attempting to improve relations with Russia. As a result of the Ukraine crisis, then-President Obama was seen as delaying improvement in Japanese relations with Russia. In February 2014, Victoria Nuland, the State Department official in charge of European affairs, was seen as complicit in assisting the forces in Ukraine opposed to the Yanukovych administration and causing its collapse. The Putin administration, which had supported the Yanukovych administration, could not stay silent about this matter. It mobilized its intelligence agencies, and conceived an occupation through military force not only by grabbing the Crimean Peninsula in the south of Ukraine directly under Russian control, but using Russian assistance in Donetsk and Luhansk in Eastern Ukraine, too. Some in Japan believe that the person most responsible for this situation is Nuland, since one can understand that assistance to the anti-government movement in Ukraine ended up producing this result. This coincides with Japan’s degree of sympathy for Russia’s dilemma in Ukraine and of caution in endorsing the US approach to managing the crisis that has ensued. A person in the Russian school of the foreign ministry stated, “(For Japan) the Kurils (the Northern Territories) are weightier (more important) than Crimea, and the strife over Eastern Ukraine is an internal struggle between Russia and Ukraine.” He then claimed that before Abe could clarify how he contemplated making progress on peace treaty negotiations, the failed policy of the Obama administration left in flames what the Japanese side had sought. With the Obama administration having left and Trump extolling improvement in relations with Russia during the elections, there were expectations that the United States would no longer seek to interfere in negotiations over the Northern Territories. Such expectations were not held only by Japanese. Just after Trump was elected in November 2016, one person in the Russian government in charge of relations with Japan spoke as follows: “If it is Trump, there will not likely be interference in advancing dialogue with Japan.” However, by now, authorities in both Japan and Russia have their beliefs left in doubt. “In any case, with Russo-US relations unsettled, it is unclear how far relations with Russia can be expanded,” a different Russia school official of the foreign ministry confirmed. If the Trump administration does not make progress in improving relations with Russia, it will not only be due to the influence of the scandals involving Russia. As of mid-April 2017, with the exception of Secretary of State Rex Tillerson and John Sullivan, chosen as deputy secretary, there were no other nominations for officials in the State Department. For that reason, there continue to be no staff to conduct a policy review. The Trump administration has left unsettled the basic principles for how it would proceed in its Russia policy. One can surmise that it will take through to this summer before it can get going by designating State Department staff, having them confirmed, preparing drafts for policy reviews, and securing the support of the president. If there continue to be staff vacancies, this process may drag into failure. The previous time Japan and Russia really discussed joint economic activity was from 1999 to 2000. However, Japan’s foreign ministry then considered that in case joint economic activity on the Northern Territories proceeded on the basis of Russian law, it would mean that this area had been recognized as Russian territory, and the ministry emphasized the importance of first resolving the legal questions. When the Russian side proposed a “special region,” Minoru Tamba, the deputy vice minister for foreign affairs in 1998 said it requires jointly preparing a book of laws, which we have no expectation will be done.3 In other words, the Japanese in charge at that time did not feel that the negotiations would lead to any serious conclusion. 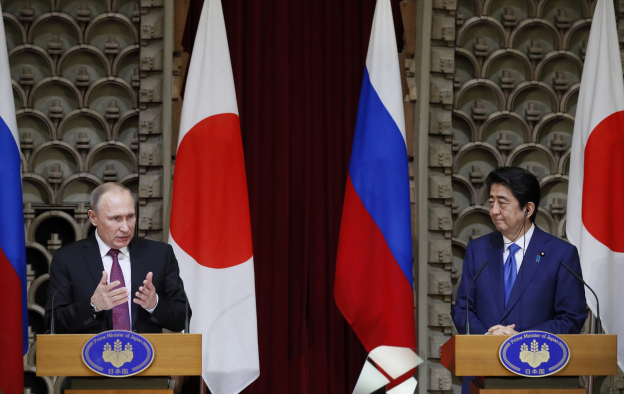 Today’s discussion between Japan and Russia has made joint economic activity the focus, but for Japan, negotiations over a peace treaty is indisputably the biggest focal point. In June and August 2016, Japan and Russia twice held talks on a peace treaty, but their positions were too far apart, and the talks ended up being suspended. This time the Russian side has kept the focus only on joint economic activity, but Harada Chikahito, the chief negotiator for the Japanese side, stressed that there should be discussions concerning the return of the Northern Territories, which are the focal point. Russian government authorities criticized Harada’s position “as old style,” and since the Japanese government stresses relations with Russia more than protection of its own negotiator, Harada was finally dismissed in March as the government representative. “At present, the disparity in the Japanese position is huge. It is facing probably no discussion of a peace treaty,” said a Russian government authority. An official in the Russian school of the Japanese foreign ministry expressed the same viewpoint. At the same time, the person in charge for the Russian foreign ministry does not have a lot of authority and it is not clear if he can discuss the return of the northern four islands. This question may need to be directly discussed between Abe and Putin. With a “go for broke” mentality, this is a challenge for which a single discussion is not enough; it must be discussed over and over again, even if, for now, talks will not be proceeding on a peace treaty. With the Trump administration, prospects for Japan-Russia relations may have worsened. Issues contrary to the Japanese government’s initial expectations have surfaced. Those who emphasized improving relations with Russia stopped with Trump, while other important officials remain fixated on a hardline stance toward Russia. The one extinguishing the flame is Nikki Haley, US ambassador to the United Nations, who at the Security Council on February 2, expressed hope for good relations with Russia, despite criticizing Russia for the tragic situation in Eastern Ukraine. She asserted to the extent that Russia does not return to Ukraine control over the Crimean Peninsula, related sanctions should be continued. In mid-February, the core figures in the new administration—Vice President Mike Pence, Secretary of State Tillerson, and Defense Secretary James Mattis—one after the other visited Europe and held talks with the leaders of its principal countries, expressing support for NATO and European allies and seeking a common foundation through a ceasefire agreement in Eastern Ukraine based on fulfilling the terms of the Minsk accord. Pence spoke at the Munich security conference on February 19, respecting bonds with allies in Europe and often speaking harshly in opposition to Russia. However, as the President Trump keeps extolling improved relations with Russia, while other officials speak harshly against it, confusion is spreading in and out of the United States about what will become of US policy toward Russia. That President Trump is constrained in improving ties with Russia does not mean that Japan and Russia should abandon proceeding with peace treaty talks. Rather, if the condition emerges that Trump cannot improve ties to Russia, the possibility is considerable that his administration will make strong demands on Japan in regard to its relations with Russia. 2. Yomiuri Shimbun, March 31, 2017, p. 2. 3. Shogen Hoppo ryodo kosho (Tokyo: Chuo koron shinsha, 2016), p. 276. 4. Asahi Shimbun, March 19, 2017, p. 4.